Cardoons are one of my favorite vegetables, but they’re frustratingly hard to find here in the US. So whenever I spy a bunch in the market, I grab them, no questions asked. I find their subtle flavor, reminiscent of artichokes, delightful. 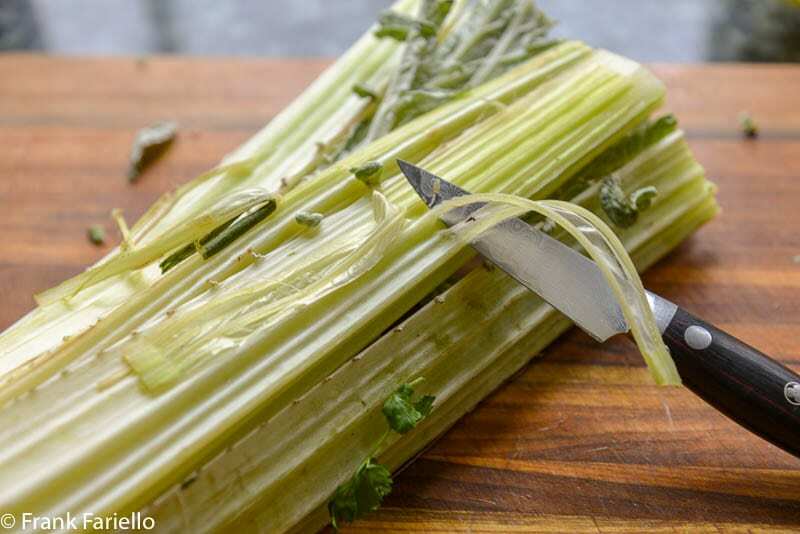 If you’ve never tasted a cardoon, you’ve been missing out on a real treat. We’ve already shown you how to gratinée cardoons to make a wonderful side dish, but they also make for a delicious first course soup called zuppa di cardi. 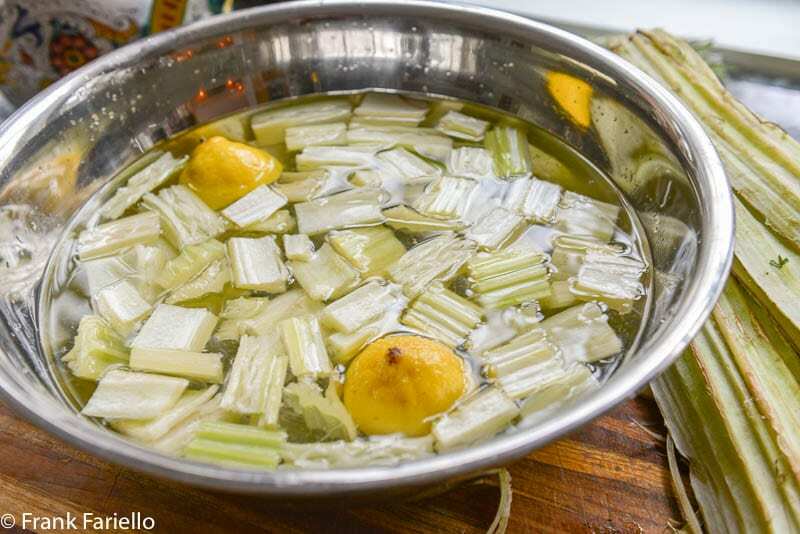 After the initial prepping, the cardoons are gently sautéed in butter and oil, then simmered in broth until tender before being ladled into individual soup bowls over beaten egg and cheese. 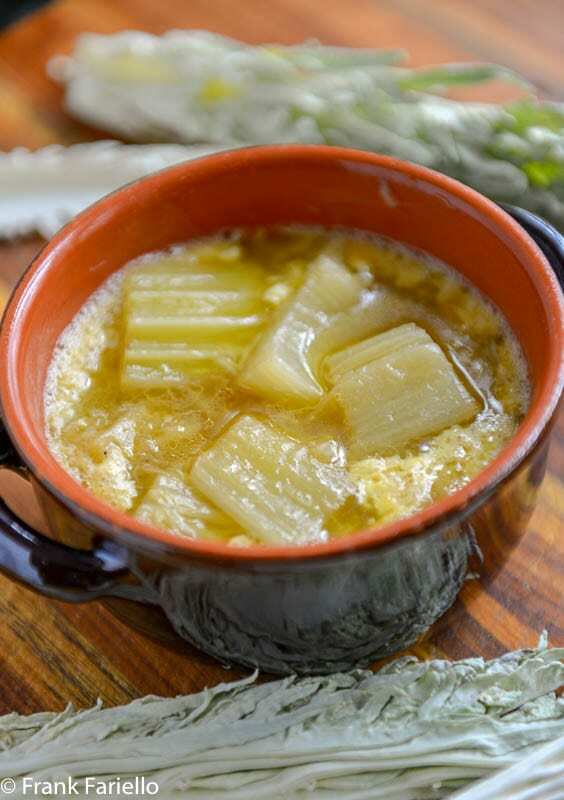 Cardoon Soup is an easy dish to make, with few ingredients to get in the way. It’s one of the best ways to enjoy the cardoon’s subtle flavor virtually unadulterated, an ideal introduction if you’ve never tried them. 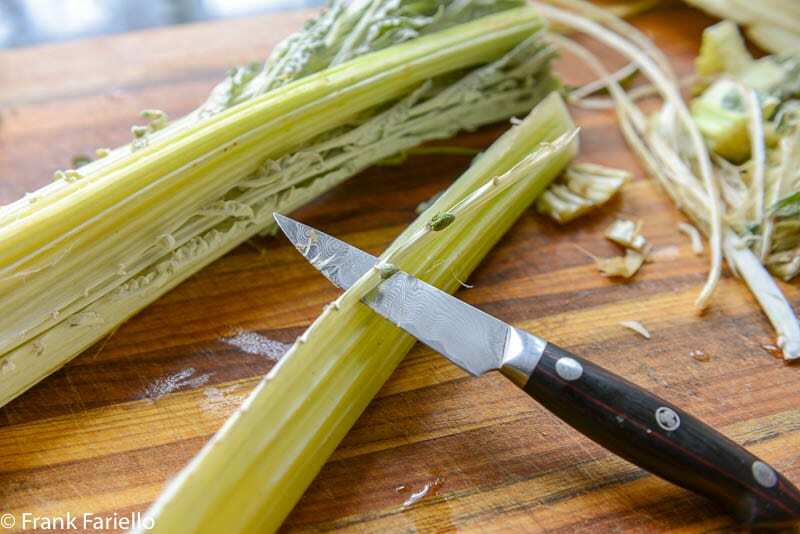 Clean and trim the cardoon stalks, then cut them into bite-sized segments (see Notes below for details). Parboil the cardoon pieces in well salted water into which you have whisked in a heaping tablespoon of flour for 15 minutes. Drain well. In a large saucepan, drizzle some olive oil and melt a good knob of butter in it. 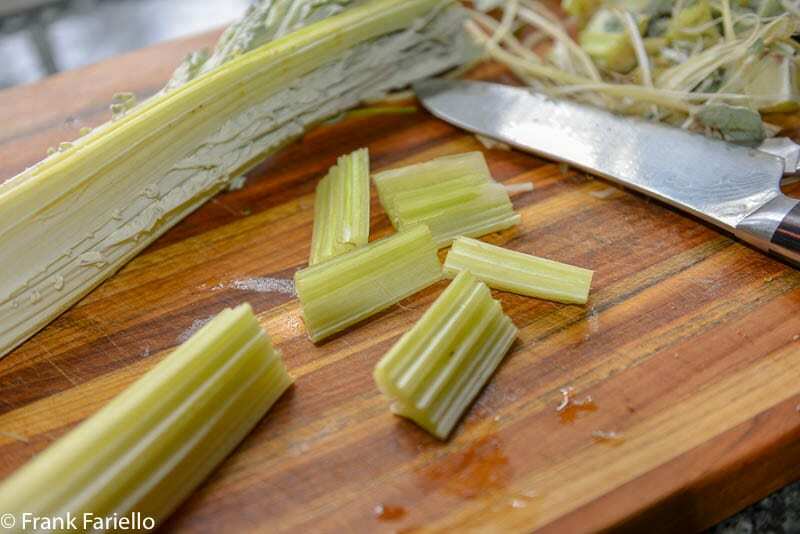 Transfer the drained cardoon pieces into the saucepan and turn to cover them well in the butter and oil. Let them sauté gently for 5 minutes or so, turning gingerly from time to time and seasoning lightly with salt and pepper. Add enough broth to cover the cardoon pieces and simmer for about 15 minutes, or until the cardoon pieces are completely tender. While the cardoon pieces are simmering, break on egg into each serving bowl, then scramble it with a good dusting of freshly grated Parmesan cheese. When the cardoon pieces are done, transfer some into each serving bowl on top of the egg and cheese. Ladle on the still simmering broth into each bowl. Serve your zuppa di cardi right away. The artichoke like flavor of cardoons is no coincidence. The two vegetables are both thistles of the sunflower family native to the western and central Mediterranean. Cardoons have been cultivated there for eating since ancient times. It also grows as far afield as Australia and California. Sadly, although the cardoon was cultivated in colonial America, it has fallen out of favor, to the point where, strange to say, it is considered a “weed” by the Invasive Plant Council (!) One can only hope one day they wake up to the cardoon’s deliciousness. They should be every bit as marketable as the artichoke. They taste just as good and, if anything, are more versatile (see below). Unlike the artichoke, you generally eat the stalk of the plant, although the flower is edible. Their season in Europe is November through February. The main disadvantage of cardoons is their rarity. I don’t know if there’s any solution to this, at least at the moment. I found cardoons this week at our local Whole Foods, but the last time I had found them in stores was perhaps two years ago, at another “premium” supermarket in our area. Farmers markets are another possibility if you live in an area where they grow—I understand that some small-scale farmers in California grow them, for example. Online purchase isn’t really an option, although if you’re adventurous, you can buy seeds and try growing them yourself. But no worries, you can always trim off the bruised bits. But first, start by cutting off the leafy tops if they’re still on. (The top of this cardoon had been pre-trimmed, but still needed another quick snip to remove the discolored top edges). Proceed to remove the outer stalks and, if they’re fibrous as mine were, discard them. NB: For those unfamiliar with the term, “acidulated water” just means water to which you’ve added some lemon juice or vinegar. Generally speaking, a one kilo/two-pound cardoon will produce about 750 grams or 1-1/2 pounds of edible material, although this rather sorry specimen gave me only about 500 grams or one pound. In any event, once you’ve prepped the cardoons this way and parboiled them, they’re ready for making in all sorts of ways. 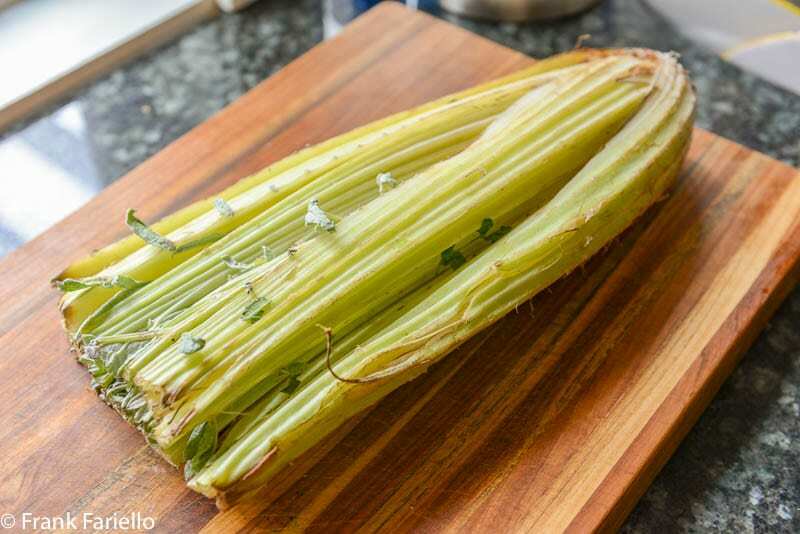 Besides in a simple soup like one above or gratinéed as we’ve featured before, you can use cardoons to make a creamy vellutata, a rich parmigiana or savory fritters. Cardoons are a remarkably versatile vegetable, and the possibilities are practically endless. If you’re a bit uneasy at the prospect of lightly cooked egg, the soup is also quite nice without the egg and cheese finish, perhaps over a slice of toasted bread. Some versions of zuppa di cardi add some pancetta for extra savor, others a bit of tomato for color. And if you’d like a more substantial soup, you can throw in some potatoes, cut into wedges or cubes, along with the cardoons. And in Abruzzo, they make a more elaborate soup, traditionally served for Christmas dinner, with little meatballs. Clean and trim the cardoon stalks, then cut them into bite-sized segments (see Notes for details). Parboil the cardoon pieces, in well salted water into which you have whisked in a heaping tablespoon of flour, for 15 minutes. Drain well. When the cardoon pieces are done, transfer some into each serving bowl on top of the egg and cheese. Ladle on the still simmering broth into each bowl and serving right away. Interesting! I must admit that this is the first time I’ve heard of cardoons. At first glance, I thought that was celery in the soup. I’m intrigued now, though! I love learning about new ingredients and how to cook them. I guess you can just chalk that up to my constant inquisitiveness. Now I’ll have to be on a mission to find cardoons around here….wish me luck on that front! Good luck! They’re really worth seeking out. Funny thing, I just read on FB about someone who found cardoons in his local supermarkets. Perhaps they’re making a comeback? I discovered this blog perhaps a year ago, and, since then, have made approx. two dozen recipes for my wife and myself. ALL have been among some of my favorite dishes I’ve tried, and quite a few have now entered the regular rotation. I have decided to plunge into this world with both feet, and we are now in my house discussing our first-ever trip to Italy . . .
As someone who worked on and off in high-level kitchens for years, and is generally food-obsessive (particularly as regards regional world cuisines), I wonder if you could provide me a short list of what you think might be the best cookbooks for Italian cuisine. I’m not shy about tracking down materials in Italian and translating the instructions either. Sorry if you’ve done this before – I’ve read through all the “essentials” and believe I haven’t seen such a list. For what it’s worth, or if it helps you narrow down the field, I’m primarily interested in southern cuisine, including Sicilia and Sardegna, and find that my favorite dishes from your site are often classified as ‘cucina povera.’ Of course I understand many of these recipes aren’t recipes per se, and may not have made it into too many more high-minded cookbooks. I’m delighted to hear you’re enjoying the site. It’s especially flattering coming from a high-level professional like yourself! You know, I’ve been meaning to do a post with cookbook recommendations, but in the meanwhile, a few ideas… First off, I have done posts on three specific cookbooks: two about Italian cooking generally, and one specifically about Neapolitan cooking. The first, Artusi, exists in translation by a cyber-friend, Kyle Phillips, who sadly passed away a few years ago. The second, Il Talismano della felicità by Ada Boni, is a cookbook that, at least back in the day, you could find on just about every kitchen shelf in Italy. Unfortunately, the English language “translation” is not reliable, including only a fraction of the orignal recipes, “adapted” in ways that distorts the original. Finally, La cucina napoletana by Jeanne Caròla Francesconi is the essential cookbook to have on Neapolitan cookery. Unfortunately, as far as I know, it has not been translated into English. And if you like “encyclopedic” cookbooks, then Il Cucchiaio d’Argento, or “Silver Spoon” cookbook is well worth having. Now in terms of English language cookbooks, I would not disdain some of obvious choices, such as Marcella Hazan’s Classic Italian Cooking, or Anna del Conte, who popularized authentic Italian cooing in the US and the UK, respectively. On Neapolitan cooking, Arthur Schwartz (yes, believe it or not) wrote an excellent book entitled “Naples at Table” that draws heavily on Francesconi’s work. As for Sicilian cooking, I rather like the books that Wanda and Giovanna Tornabene, who run a cooking school in Gangivecchio, have written, and Mary Taylor Simenti’s Sicilian Food (also published under the title “Pomp and Sustenance”). As for Sardinian food, I’m afraid I’m at a loss myself. Anyway, this just scratches the surface, but you couldn’t go wrong with any of these for a start. I will definitely be looking for these. I don’t think I’ve ever tried them and know I haven’t cooked with them. This will be fun! Thank you for the introduction and delicious sounding soup recipe. You’re welcome, Valentina! I think you’ll really enjoy cardoons. Since you’re in California where they grow, I bet they’ll be relatively easier to find. Good luck! I’m with Valentina: I’ve never had a cardoon, and don’t even know if I’ve ever seen one (I’ve heard of them). I know I’d love them if they taste like artichokes, though. Reminds me of how Americans have treated black currants 🙁 They thought they carried a disease and were killing off some native tree, so they banned them. Turns out, it wasn’t true, but now most people have no clue what they are in this country and they’re SOOOOO good for us! Ugh. Hopefully cardoons and black currants come back into favor in the US. I’ve had black currents but only because I lived in Italy where “ribes” figure in many desserts as you know. Would love to have them Stateside! We can only get cardoons in one store here, and I will start looking for them today. I seem to recall they sell the stalks separately, which is why I was confused at fist when your ingredient list said one cardoon, about a kilo! That would be one humungous stalk! Mark and I made a gratinéed cardoon dish many years ago, and both loved it, but have been looking for just the right new dish to try. Your soup fits the bill perfectly – such a perfect dish for a special dinner. Selling cardoons by the stalk is an interesting idea. Actually makes some sense when you think about it, since a whole cardoon is a lot of food for a couple or small family. Yes, cardoons are nor well-known or easily available in rural Australia either. Do like your version and methinks know of a few sources . . . this easy dish will find its way to my table soonest . . . Sounds amazing. What is the reason for the tbsp of flour in the parboiling water? Thank you, Frank! I bought cardoon seeds this winter and I look forward to making this soup very much! Fantastic, Susie! Best of luck and do let us know how things go. Frank, what a wonderful sounding soup you’ve made. We also have a cardoon soup here called Kardonsoppa, but the only similarity is the cardoon. I had not tasted cardoon prior to moving to Europe and like you, I can’t understand why it’s not more widely available in the US. We still had some at our veggie market last week, I’ll look today and see if I can find some so I can make this soup. It’s more of a cream of cardoon soup, I suppose? That’s also very delicious. And yes, funny thing about cardoons in the States. And the climate in some areas is perfect for growing it, too!